Colin from The AniMonday Podcast here! Each week we hit the "random" button on Crunchyroll, and must watch whatever pops up. We did a podcast about Z/X Ignition that you should definitely check out, whether you've seen a couple of episodes or not! Blah Blah Blah. Not the best anime I've watched at all. However. It is overall pretty good when putting everything together. Splitting up pieces and topics in this anime would probably ruin everything this is. Yep. Thats That Folks. Uh Huh. I dont have anything more to say. Great character and scenery design. The worlds just draw you in visually. The story leaves a little to be wanted. The pacing seemed a bit off and the show seemed rushed toward the end. Speaking of the end, it feels a bit lacking. I still give this show 4 stars, mostly cause the good episodes outweighed the overall of the show. I still hope they bring it back to put a good close on it. If you like visually stimulating anime, this is for you otherwise, it is not 100% story driven. In Z/X Ignition, modern day Japan has had 5 strange black spheres called Black Points appear across it, each connecting to a world associated with a different colour: red, blue, green, white, and black. From these spheres, creatures given the title 'Z/X' (short for Zillions of Enemy X) begin appearing, able to maintain their existence on Earth by drawing power from the 'Black Points', thus ensuring they're not able to go too far from them. That is, until something called a Card Device is created, allowing a person to supply energy to a Z/X in lieu of the Black Points. The opening episode features some rather exciting action, with the Z/X fighting each other and really giving the impression that this is a more mature take on the Pokémon concept. As the show progresses, you see less and less of this action, and despite some really interesting concepts and potential... the show is just dry. It's boring. It just doesn't really make use of its potential for anything. Between the way the opening sequence starts and the several long introduction episodes, the show gives you the impression that something big is going to happen. Sadly, it never does. The crescendo just sort of peters out and you're left with a strange plot twist that leads in a really awkward direction. And when it all settles, you're left with an ending that really felt more like a 13 episode long prologue or introduction rather than an actual season of a show. When I first heard that Z/X Ignition was based off of a card game my expectations for this anime was close to none. However, watching the first episode of the anime caught me by surprise. While the source material is a card game the anime approaches the story with the adventure genre. Z/X Ignition grabbed my attention. With creatures of myth, warriors of legend, combat androids, or deities from different origins all fighting in Japan. It was fun just to see what would appear next. But while it was fun there are some major flaws in the plot. This can be a matter of viewers perspective but with that said the story could've taken a turn for engaging plot twist and heart wrenching development. Instead, we have convenient development for cookie cutter events. And when certain characters could be killed off for the better of the story they don't do it. Although the story may benefit from the diversity the same can not be said about it's cast. The story of Z/X Ignition requires there to be a partnership between a human and a Z/X. So when characters are introduced we can assume there to be at least 2 characters that show up. All the characters come from different factions as well. Training us to remember the connections of a faction to the characters. Another problem about the cast being from different factions is the perspective of each character. While the characters are seemingly from different worlds and environment they all seem to have very similar values. leaving me at times suspended from disbelief. And then the last problem about the casting size is the distribution of the characters stories within 12 episodes. There simply were to many characters stories that were being executed. It is hard to care about all of the characters when the grand scale of the story was set so high. The music of the anime is underwhelming. No stand out tracks and music that doesn't seem to bring out the full potential of the situation. But of course the dubbing I applaud the artistic style of Z/X Ignition. Comparing to other anime that are based off of card games such as Yu-Gi-Oh by Takahashi Kazuki or Card Fight Vanguard. This artist has potential. The animation is fairly average. During the scenes that do not matter the characters lose consistency but when the scenes do matter it's not as noticeable. Z/X Ignition is an average anime through and through. There is no need to rush to watch this anime but it is not something you'll dread. But I do hope this anime gets a second season because Z/X Ignition certainly begs for questions. I'll keep this brief so people take my word for it. This show does many things incredibly well and simply needs some polishing should some future OVAs or seasons arrive. The relationship between the characters and the backstories to many of them are developed amazingly well. (Some characters have sparks of background that aren't quite developed but show the start to something amazing, probably in hopes for a future sequel of some sort). This show is actually really well done and really enjoyable. If the creators just spend a little more time and money polishing things up, it could be stunning. So watch this if you want to see an interesting form of realistic sci-fi that has incredibly character development. It deserves more respect than it gets. Should a second season come out that focuses on action and writing more than character development, the show as a whole will knock you off your feet. There's people hating this show because of the fact it's base on a card game. I think that people have to understand that shows like this brings the life to the cards since the show is based on the lore of Z/X aka Zillions of Enemy X universe. Like Kancolle, which is a popular browser game in Japan, want an anime based on their favorite game coming to life. Same for people that plays Cardfight Vanguard and/or Yu-Gi-oh! It maybe a scheme to spend money on the products, but just the idea you have something that you like and it means something. Even if you thinks it's just cool! I've seen Yu-gi-oh, and Dual Masters(ugh) and first was okay and second I wished I could scrub its english dub from my brain. 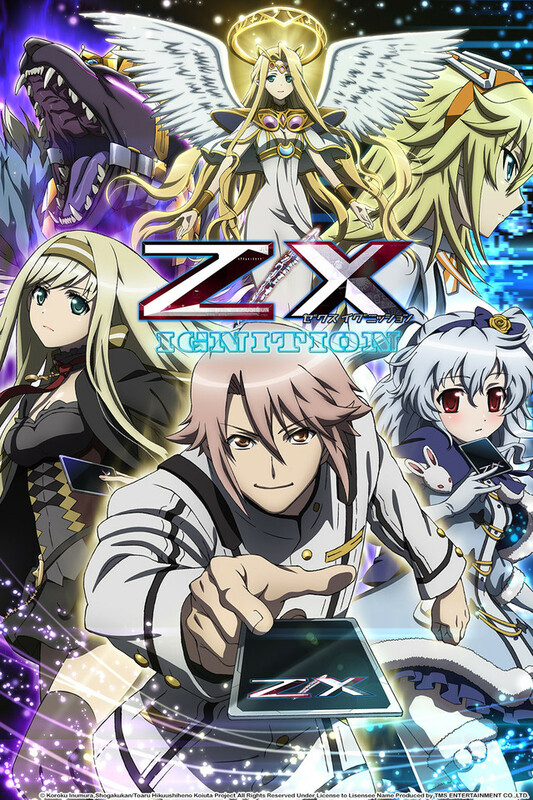 Z/X i had hesitation about but so far I think its story to be rather enjoyable though some the characters suffer from tragic or sad pasts. The story is just getting started and the characters not yet assembled as the story is taking a round about but not boring route to begin its tale. So it worth getting into for the first 7 episodes and am hoping it pick up even more starting on 8. Give it a try. Might just be a rip off of one of the "Greater Goods"
I'm not really feeling this anime... Its like Cardfight Vanguard and not only that, they're trying to pull off something better than Yu-Gi-Oh! This is BULL and should be stripped of popularity... If they can come up with something HONESTLY unique, HELL i'd rip my good looking hair out and strip naked in public.